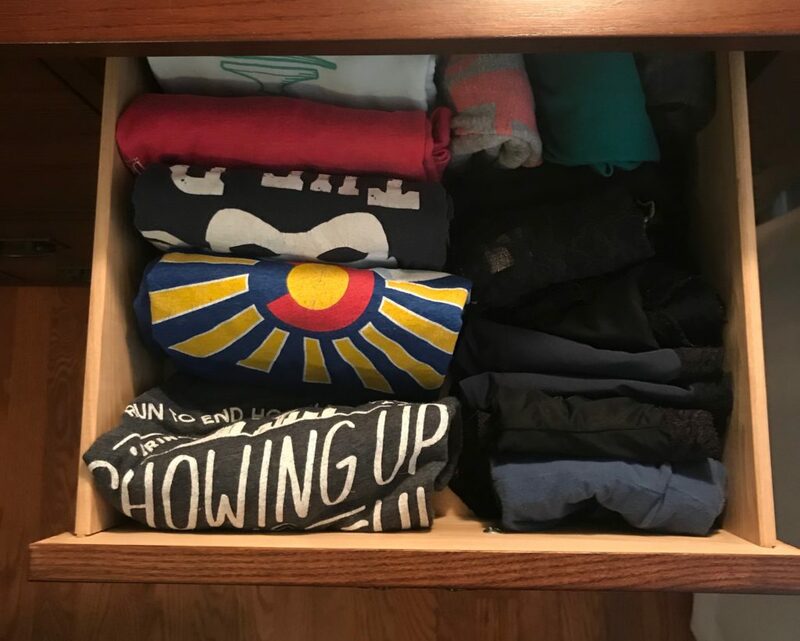 My girlfriend and I finally gave into the Marie Kondo craze earlier this year. I wouldn’t have called it a craze in 2019 since her book came out nearly 5 years ago, but her new TV show Tidying Up dropped on Netflix in January. It should be shocking to anyone who knows me that it took so long for me to check her out. The book title alone should have been enough to hook me, but I still haven’t read the book. I did read a bunch of articles and watched a few videos about the book when it was first published. Her style of folding shirts changed my life. I love being able to open my dresser drawer and see everything in the drawer all at once. Like, seriously love. On Kondo’s show, a couple overwhelmed by their stuff is saved by this cute little joyful sprite of a woman who does things like “greets” their house and “wakes up” books that have been in boxes before explaining how to sort them. Her signature technique (besides the aforementioned amazing laundry folding) is to focus on one category at a time, gather everything from that category into one place, hold each individual item and only keep the items that “spark joy” when you hold them. More than once my girlfriend turned to me and said something like “That’s just how you did it with me and my stuff.” It’s true. I had watched enough organization shows in my life to know the process (do I have any Mission Organization or Clean Sweep fans out there? No? Just me? OK.) and had implemented it in my own life and the lives of some of my friends and family. There’s always a moment on Tidying Up where things get worse before they get better. I have definitely witnessed this before. I remember helping my girlfriend do some tidying up in her home a couple of years ago. She had this lovely hutch that she had used as a junk drawer. This was a hutch. It had multiple drawers and cupboards and all of them were treated like a junk drawer. That doesn’t mean the stuff in there was junk. It just means that things were treated like junk. Everything was kept, so everything seemed to have equal meaning. Back to the hutch. We emptied the contents of the hutch onto the living room floor. Then I had her consider every single item to determine what it meant to her so she could decide whether or not to keep it. The volume of stuff and the thought of considering each thing was too much to take at times. Some things she found were very sentimental and sometimes a break was needed. But she persisted and felt proud, light and happy when all was said and done. Anxiety comes from not knowing what’s not getting done. When we were done tidying up there was no longer the weight of “What’s in there? Am I missing something?” on her mind or her heart. Things were clear, known and had a place, and she felt lighter as a result. As my girlfriend and I watched episode after episode of Tidying Up we were warmed by the shift this simple, but challenging technique had on people. 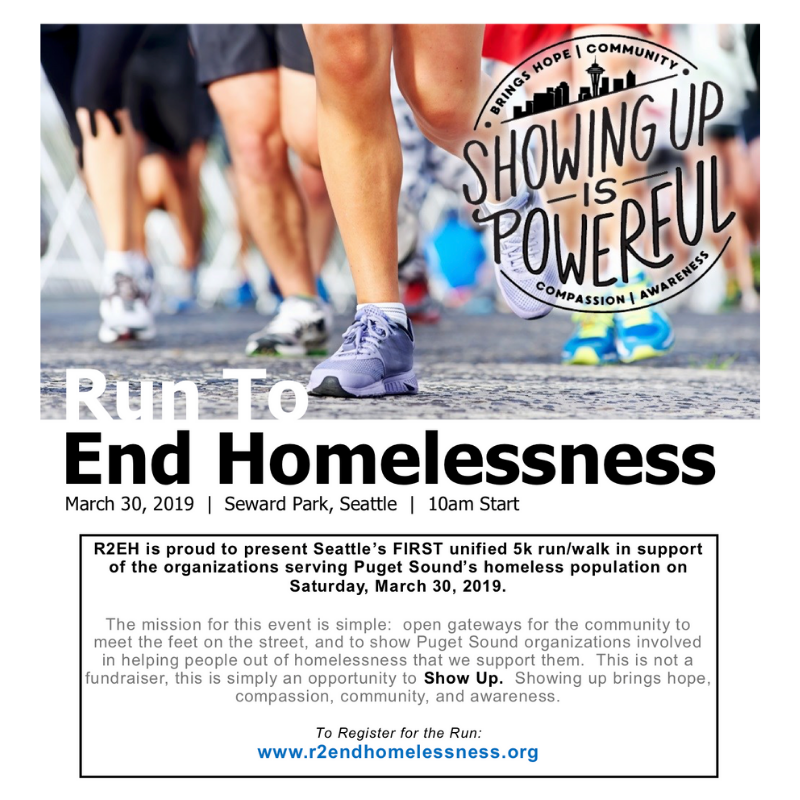 Sure, their houses got cleaned up and Goodwill got a ton of merchandise, but more impactful were the connections made between partners, the pride in what they had created for themselves and the vision they had for the future. In tidying up their everyday surroundings, they freed up energy to connect with their values, to be more present with their people and to imagine more possibilities for themselves. After we binged Kondo’s show on Netflix, we got inspired and tackled our clothes. We pulled every last piece of clothing and shoes from everywhere in the house and piled them in the living room. We decided which ones brought us joy. We donated what didn’t. Then we categorized and folded things more effectively and put them away. We donated 6 bags of clothes and shoes…each! We were more clear about our priorities for our future clothing purchases. Using this method in just one area of life got us more focused and clear about our priorities. It’s made us more discerning and has saved us money because we don’t want to go back to our old ways. The same thing can be said about tidying up the ground level elevations of life: Actions and Projects. Doing so frees up energy to achieve your Goals, and live your Vision, Values and Purpose. In other words, tidying up the overwhelm of day-to-day life frees you up to be more present, creative and intentional. Intention is what leads to sustainable success and a more fulfilling life. 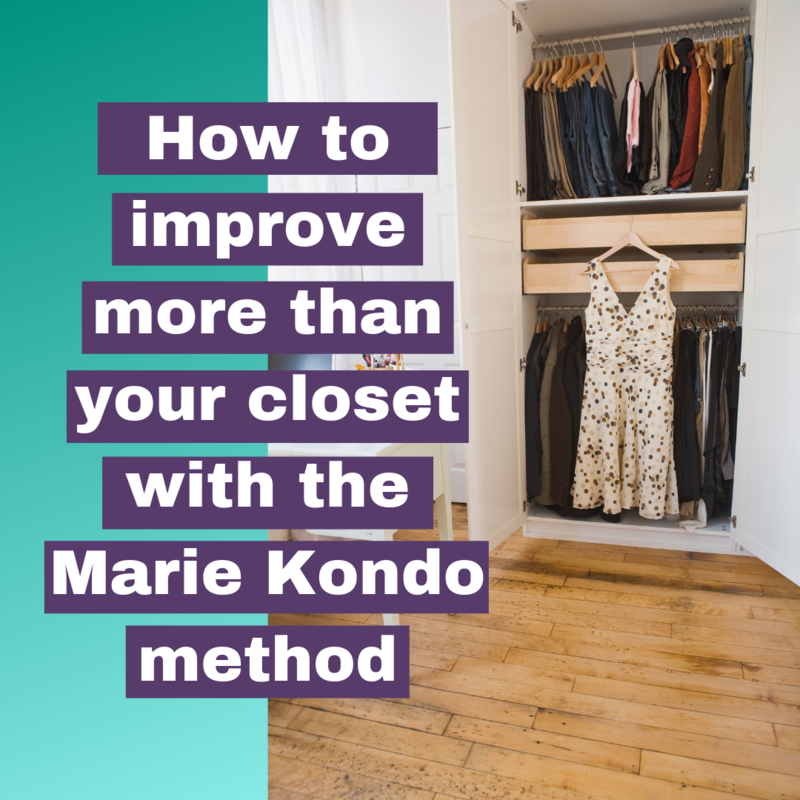 So how can you take some of Kondo’s concepts beyond your closet and apply them to the stuff that’s on your mind, in your inbox and cluttering your desk? Gather everything together: Create a limited number of places that you’ll intentionally gather undecided, to-be-determined things until you can consider them. Your email inbox, an in-tray on your desk, and a task app on your phone/computer should do. Consider each item, one-by-one: Look at each email, piece of paper, idea, request one at a time and ask yourself two questions: 1. What does this thing mean to me? 2. Do I need to do anything about it? Let go of what you don’t need: Keeping things that don’t matter undermines your system and your sanity. Delete the email. Shred the piece of paper. Let go of the idea that’s no longer exciting. Group like things together: Put all actions in one place (your task list). Create folders for emails that you need to keep so they are no longer in your inbox. Put every appointment on your calendar (including your drive times…drive time is an appointment with your car). Do this and you will feel lighter, just like Kondo’s clients on her show. Unlike a Tidying Up episode, this process of tidying up your mental space doesn’t happen once. You’ll receive new emails and texts . Your brain will have new ideas. Your friends, family and clients will continue to have requests. You’ll aspire to learn and grow. In other words, the stuff will keep on coming in. To continue to feel lighter and get your energy back, this is a process you should repeat weekly. I know first hand as I go through this process in my workspace every week. It’s amazing how much relief this gives me. I’ve also taught my clients how to do this in GYST, my 6-week productivity training program. As on Tidying Up, I get to see them reconnect to themselves and become lighter, calmer and more intentional. I get to see the pride they have in what they have created. I get to see their energy come back as they get redirected from all the clutter of day-to-day life back to what matters most to them. And that sparks joy in me. Ready to be more productive but aren’t sure if GYST is right for you? Click here to schedule a complimentary strategy session with me. The other day I was chatting with a friend who is going through a divorce. Having felt a ton of relief over the past couple of years since she moved out, she was caught off guard when she recently felt herself missing her ex-husband. “Yup, sounds about right”, I told her. When someone talks to me about divorce, one of the things I have shared most about the past 3 and a half years is that you *think* you know what the hard milestones will be: Birthdays, wedding anniversaries, holidays, etc. Those are definitely hard, but you kind of see them coming. You might even be able to prepare for them a bit. It’s the unexpected milestones that take your breath away and throw you right back into the hardest moments, deepest sorrows and currents of doubt. I’ve had a couple of these milestones lately. One was understandably emotional: the death of our dog that he and I raised from puppyhood. The other was totally transactional. It was something I knew was coming because we had an agreed upon date for this thing to happen, but I had no idea that it would also involve an emotional wave that would toss me about. I was just talking to a dear person last night about this. She too has gone through a divorce and has a name for these unexpected milestones: The Wreckage. The wreckage just washes up on the shore every once in a while. You don’t know when it will happen. It’s just suddenly there. I’ve learned that the wreckage isn’t a thing you can rush or wish away. You can’t ignore the wreckage. You can’t pretend it’s not there at your feet, on the beautiful beach of your life. You need look at it. Take it in. Honor it however you need to. And then, in it’s own time, it will wash back out to sea. The thing about this wreckage of mine is that it was created very intentionally. Next to not having kids, I think my divorce was the most intentional thing I’d ever done up to that point in my life. I used what I consider to be the 3 key ingredients for intention during the divorce: clarity, communication and consistency. I couldn’t have told you that clearly at the time that I was following that model, but it’s how I’ve always worked with my clients, so of course it showed up in my own life. Clarity. I got really clear about how I wanted the divorce to go. I used the following definition of conscious uncoupling as my guide. Characterized by a tremendous amount of goodwill, generosity and respect where those separating strive to do minimal damage to themselves, to each other, and to their children as well as intentionally seek to create new agreements and structures designed to set everyone up to win, flourish and thrive moving forward in life. Communication. I communicated that to my then husband and we clarified together what that would actually look like in the areas of our life. Everything from finances to our dogs to dating other people. Consistency. Along the way we set up systems of consistency to support us. From legal agreements to getting support from friends and professionals. This included this Facebook post. A bit of wreckage that washed up at my feet recently thanks to the “On this day” Facebook feature. Sometimes I love “On this day” and sometimes I want to just punch it. 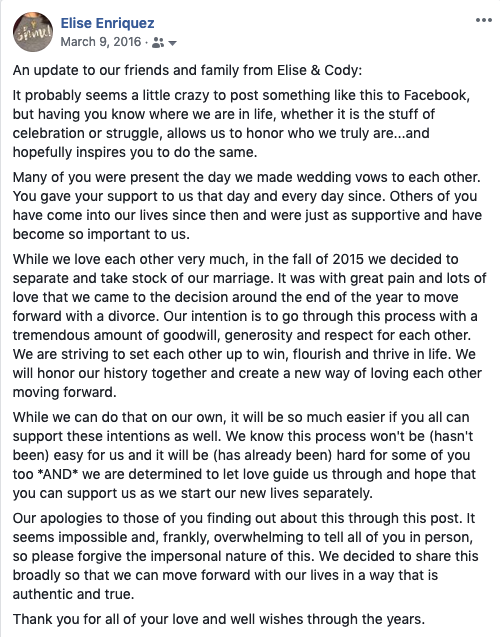 It felt strange to do this so publicly, to announce our divorce, but it was critical that everyone was on the same page as us. I’m not saying everyone was on board. A handful of people took sides and/or tried to stir up drama, but only a few. I’m not saying I never once uttered a negative thing to anyone other than myself. I had my close people that I could vent to. I’m not saying there hasn’t been pain, frustration, jealousy and anger. But underlying all of it was love. I took something wholly unknowable to me and started taking the steps that would take us apart as a couple, but would grow us as individuals. Love was my intention. I wanted love to prevail even if our marriage didn’t. I knew that couldn’t happen unless I was intentional. That’s all you can do when faced with a necessary shift in life. Pause and be intentional. Get clear on what you want. Communicate it to those who matter most. Set up whatever you need to be consistent. It doesn’t matter if the shift feels big (divorce, anyone?) or small (changing your eating habits), intention will carry you through. What shift are you facing right now? What would it look like to get clear? Who do you need to communicate with about it? What do you need to set up to be consistent in your intention? Know that when you make these shifts, there will be wreckage. 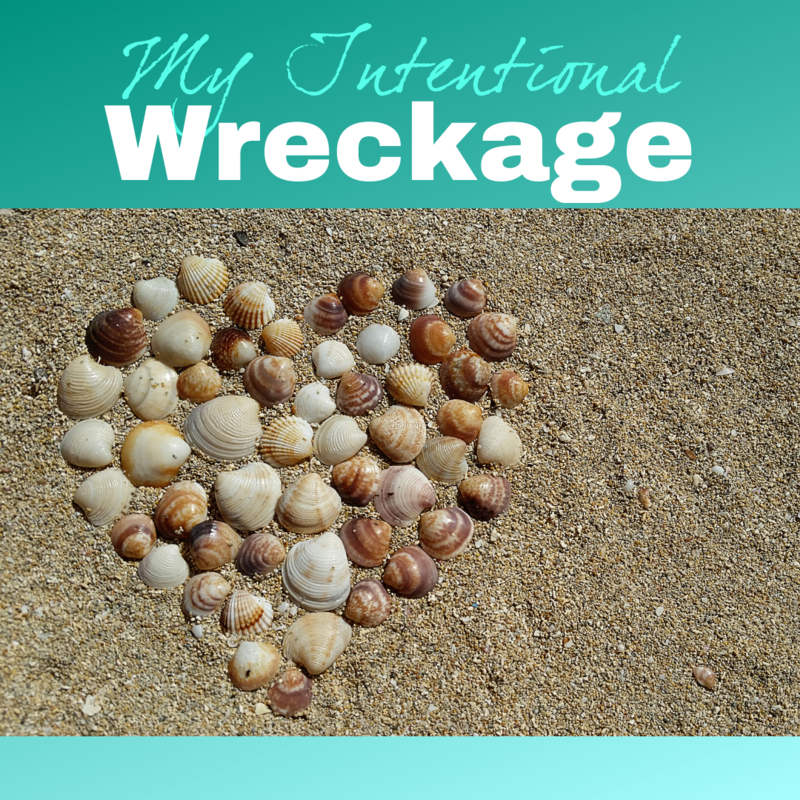 That wreckage will wash up on you shores every now and again, but when you shift with intention, at least it will the wreckage of your making. Saturday: My girl has been si-i-ick the past few days. An aching, feverish?, joyless lump on the couch. That’s how you know Kim is sick. The joy factor decreases significantly. I had been gone all morning judging at a local DECA competition and as I drove home I could feel the anxiety of cabin fever in my chest. Even though I’ve been healthy and had been out in the world all week, I also felt like I’d spent a lot of time on the couch with her while she was sick. I couldn’t go back to the house and just hang out. The sun was out. I wanted to be out in it somehow. I wanted to be out in the world…with her, if possible. So, rather than show up at home with that anxious energy, I called her to warn her. LOL. When she answered she was a little out of breath. “What are you doing?” I asked. “Sweeping. I had cabin fever ” she said. That was a good sign. She was up and moving. “Sounds great!”, she said. I could have expected that response. That’s her response to everything. I double and triple checked that she felt up to it before ending our call and drove home with a smile on my face. I came home to find that she had taken down the outdoor Christmas decorations. It took me a few minutes after coming inside to figure out why she’d been sweeping. The Christmas tree we had undecorated last week had been removed from the house. She was obviously feeling a bit better, but I was worried that she’d blown her energy on that housework and that she really wouldn’t want to go out to lunch now. Not to mention the fact that there was the telltale sign of lunch dishes on the coffee table. I popped my head into the bathroom while she showered. “You ate lunch already, silly, we don’t have to go out.” I said. So we did. We went to the place where we had our first “public date” 3 years ago. We call it our “public date” because it turns out we had been dating for a bit before that, just in private. We had known each other for a few years. First professionally and then as distant friends/acquaintances. In the summer of 2015 I started taking voice and guitar lessons. Kim and I reconnected that fall after I had committed to a December recital where I would sing AND accompany myself on guitar. She saw that I was still in shock from agreeing to this recital and said that she had picked up guitar again recently and proposed that we try playing together. So we did. Over the course of a few months she helped me practice guitar and I helped her become a more confident singer. The recital came and went. Through it all we became good friends and, eventually, fell in love. All of the first date kind of stuff happened over a long time and in the privacy of our own homes. Once we figured out that we, like, really liked each other, we decided that we should go out on a proper date. A “public date”. We went for brunch at Anthony’s Beach Cafe in Edmonds. 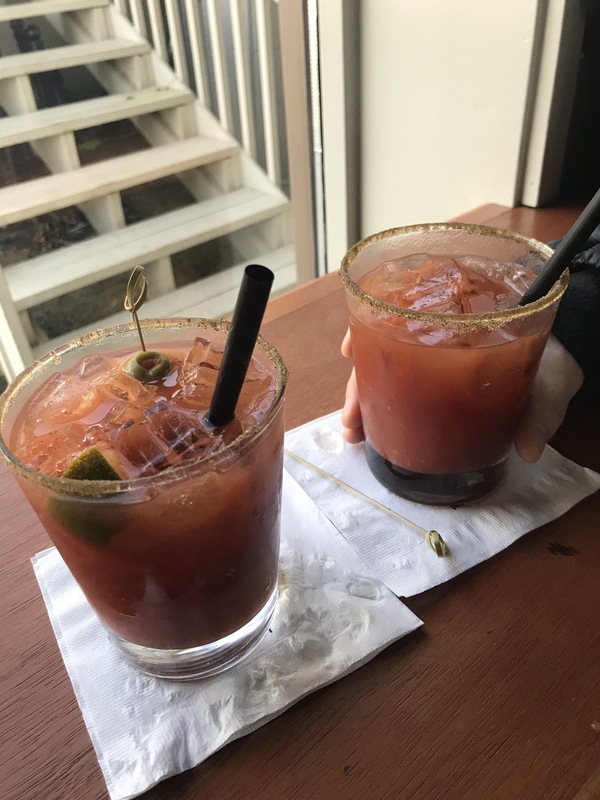 We had delicious Bloody Marys, a great lunch, and engaging conversation. It was a sunny winter day so after lunch we strolled along the waterfront. We were walking North along the water when we saw a ferry coming in. I don’t know what got into me, but suddenly I said, “Wanna go on a ferry ride?” “Let’s do it!” she said enthusiastically. We realized that the ferry was coming in awful quick and we were still a ways from the dock. So we started jogging to the terminal. Kim in her cute gray sneakers, me in my black boots with heels. That was the day that she decided that she would take me boot shopping for cute, casual boots. My boots didn’t slow me down too much. We made it to the terminal, bought our tickets and walked onto the ferry. We went outside and limbed up to the upper deck. We held hands. We listened to Beyonce. She danced. I giggled. We snuggled. We smiled, a lot. I looked adorable in her knit cap that she let me borrow. We even snuck a kiss or two. It felt excited being out in the world with her. It was also very scary. I was nervous being out on a date with a woman and being so bold as to hold her hand, much less kiss her. That’s how I knew how much I cared for her already because I did it anyway. Fast forward 3 years and there we were again. Having Bloody Marys at the Beach Cafe. A great lunch. An engaging conversation about our future. We watched a ferry come in, but I knew I was pushing my luck to keep her out of the house this long. I could tell she was tired. We did drive to downtown Edmonds and strolled the shops for a bit. We held hands. We laughed. We shared memories. We bought a gift for a friend. I tried on reading glasses and she gave a thumbs up or a thumbs down. She got tired so I took her home, smiling again as I drove. 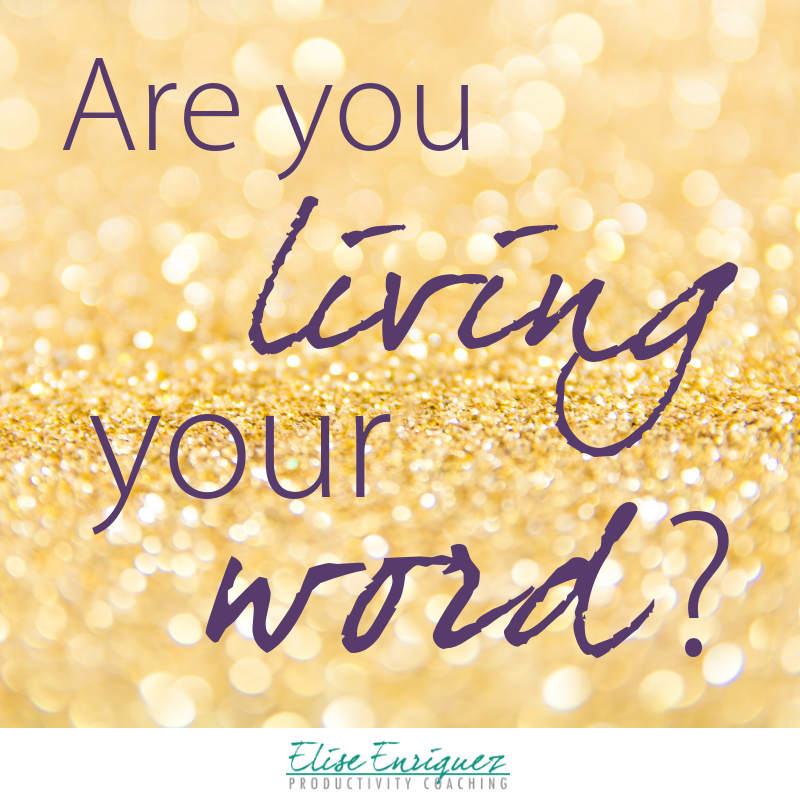 Tell me: What do you want that you aren’t saying to those who matter most? What are you willing to do in spite of the fear you may feel? Let me just cut to the chase. My word of the year is Shine. OK, now let’s start from the very beginning. In January of 2016 I went to what is called the “White Stone Ceremony” at Seattle Unity Church. I was going through a big transition in life and when a friend invited me to the event I thought “Why not?”. The minister gave a brief sermon and then a guided visualization to help us imagine the year ahead. I wish I could remember exactly what she said and the questions she asked, but I was so in the moment that I didn’t hold onto any of that. At the end of the visualization she had us sit in silence and meditate on the year we imagined until we could come up with a word that could be our guide on the journey through the upcoming year. My word was actually two words: Bold and Brave. I knew I’d be navigating a divorce that year and I was going to have to be bold and brave in order to hold onto myself as I went through everything involved in and surrounding that process. I didn’t go to the White Stone Ceremony in 2017, but I knew that I needed to follow a similar approach and come up with my word for the year. I decided to look back at the lessons from 2016 and see if there was anything that could help me in 2017. My word for 2017 was three words: Every Day Matters. In going through my 2016, when the times were the worst, I realized that it was the every day stuff that filled me up. I knew that as I rebuilt my life and business in 2017, I needed to do so in a way that focused on what I could do every day and what could give me every day joy. I didn’t want big moments and to achieve major milestones if my every day life sucked. Rolling into 2018 I once again looked back at what I could learn from the previous year. I saw that throughout my work I had created a variety of tools, programs and services. It was time to pull them all together into a more cohesive message. The same could be said for other aspects of my life. I had tried different ways of working out, eating, socializing, etc. I needed to start pulling the best of what I had experienced together. My word for 2018 was just one word this time: Gather. I knew that if I gathered all my greatest hits in life and work, I would become stronger. Just like strands of fiber can be pulled together to make a rope that can anchor a ship. This brings us to 2019. Once again, I look back at my past to see what I can learn and apply to my year ahead. I spent a lot of time last year on stages or in conference rooms in front of people. I was presenting really solid content. I was sharing some of my favorite wisdom I had learned from all of my studying and living. But I still wasn’t really sharing me. My favorite coaches that I’ve hired are a lot like me. They have an expertise and a focus AND are also just very skilled coaches who can help you with whatever you bring to the table. I’m a lot like the latter half of that statement. I can help you with whatever you bring to the table. But sharing my specific expertise? Well, I wasn’t always leading with that. I wasn’t sharing my experience so that people knew that I knew what I was talking about. I’m an expert at creating systems and strategies to move forward your most important goals, ideas and dreams. I’m an expert at bringing clarity to your purpose, values, vision, and goals. I’m an expert at helping people communicate what matters most to who matters most. I need to let all that shine. And there it was, SHINE. My word for 2019. It’s kinda perfect. 2019 will bring about the 10th anniversary of my coaching business. The original name for my coaching business was “Shine A Light Coaching”. Back when I started my coaching practice, my goal was to help other people shine their light and then I spent the next 10 years truly learning how to shine mine. 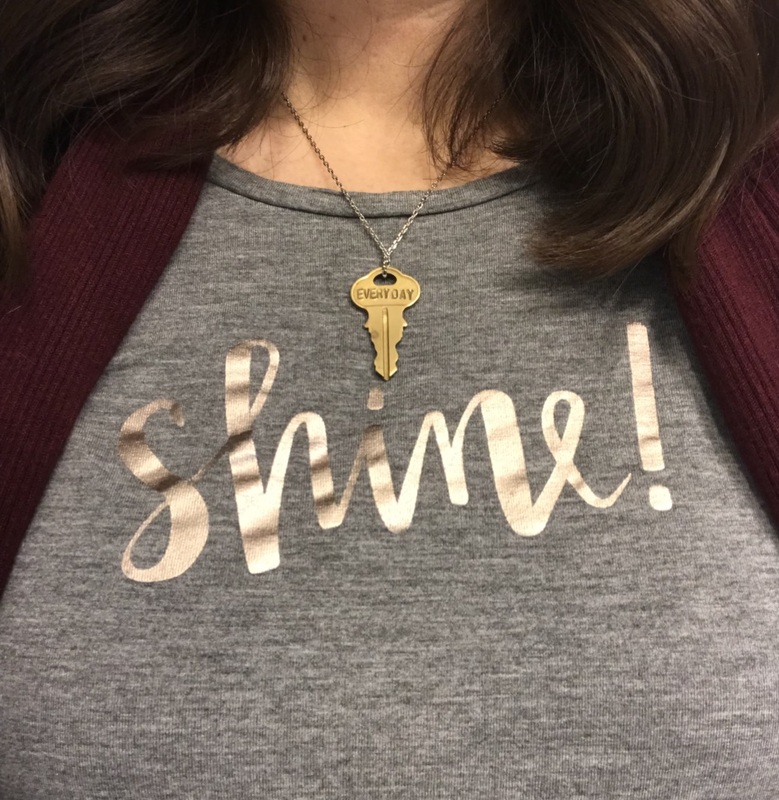 So that’s what I’ll be doing in 2019, shining my light…and helping you shine yours. Last month I did something crazy and awesome. I signed up for a 30-day challenge to run a mile a day. In December. The “in December” thing wasn’t hard because of winter, I wasn’t gonna run outside, silly. I got a membership to the closest gym to the house so I could pop over every morning for my mile. The “in December” thing was hard because of all the holiday stuff. Like everyone, I had a lot going on. A very full month. Social events. Family events. Travel. Wrapping things up for the year with my clients. Yowzer. The good news? I was already working out at OrangeTheory Fitness twice a week and always got in a mile each time I was there. I just had to add 5 more runs to my week. How did I do it? This won’t be a surprise to those of you who know me. I planned my runs. I looked ahead a week at a time and scheduled my runs. Even on the mornings I had my networking meeting. The one where I had to get there at 6:45 to set things up. It didn’t take long for me to start going to bed earlier. I didn’t want to miss a day. It wasn’t a big deal if I missed a day, I would just have to make it up the next day by running 2 miles. No thanks. I wasn’t going to miss a day. The other reason I was able to pull this off? There was a private Facebook group set up for the challenge where every one participating checked in every day. We were expected to report our celebrations, struggles, insights and anything we learned along the way. Being the rule follower I am, I reported my progress and insights. Every day. Not everyone was running a mile a day for the challenge. My girlfriend was drawing for 15 minutes each day. Other people were journaling every day. Some were committed to planning their day each morning. Some committed to one mindful meal per day. What we all had in common was that we wanted to explore building a habit and we had come to accept that we do better when we are doing things (even different things) with other people. We all showed up in that group to be accountable AND to support each other. This next part breaks my little perfectionist heart. I didn’t do all 30 days. I had actually planned out all 31 days in December and completed 28 days. Here’s the thing, all the planning in the world can’t anticipate when a very determined stomach virus will hit you. One hit me, hard, on December 29th. I was down for 5 days. December ended and I hadn’t completed the challenge. So, can I count my 30-day challenge as a success? Yes. Yes I can. Just the other day my girlfriend said, “You did a February size challenge in December.” Get it? 28 days? She’s so sweet. January rolled in and I started feeling better. Just in time to get back to work. I also got back to my Orange Theory workouts by January 4th. Even in December I knew I wasn’t going to stick to a mile a day moving forward, but I wanted to work out more than I was before the challenge. Yet, I was back to my Monday & Friday Orange Theory workout routine. So what was I going to do about that? And then I got an e-mail from Audible. I was going to lose a credit so I better buy a book soon. About the only audiobooks I can stand are memoirs read by the author. Michelle Obama’s book Becoming was featured on Audible that day. I checked and sure enough “read by the author”. So I bought it. Listening to Anna Kendrick read her book Scrappy Little Nobody got me through my December challenge. Her stories of pursuing her Broadway and Hollywood dreams inspired me and distracted me as I pursued each mile in December. Now, I had Michelle Obama’s book all ready to go. But when was I going to listen to it? My January challenge is to write for 15 minutes everyday and that is not gonna give me time to listen to Obama’s book. So, I found myself checking my schedule last night to see what time I had to get up to get to the gym for a run. This morning I discovered that Michelle Obama is a great running buddy. Being a part of this challenge was exactly what I needed to explore and change my habits. I have resisted my need for community and accountability in the past. Not anymore. I know that community and accountability are critical ingredients to making change in my life. So the December challenge was just the beginning. 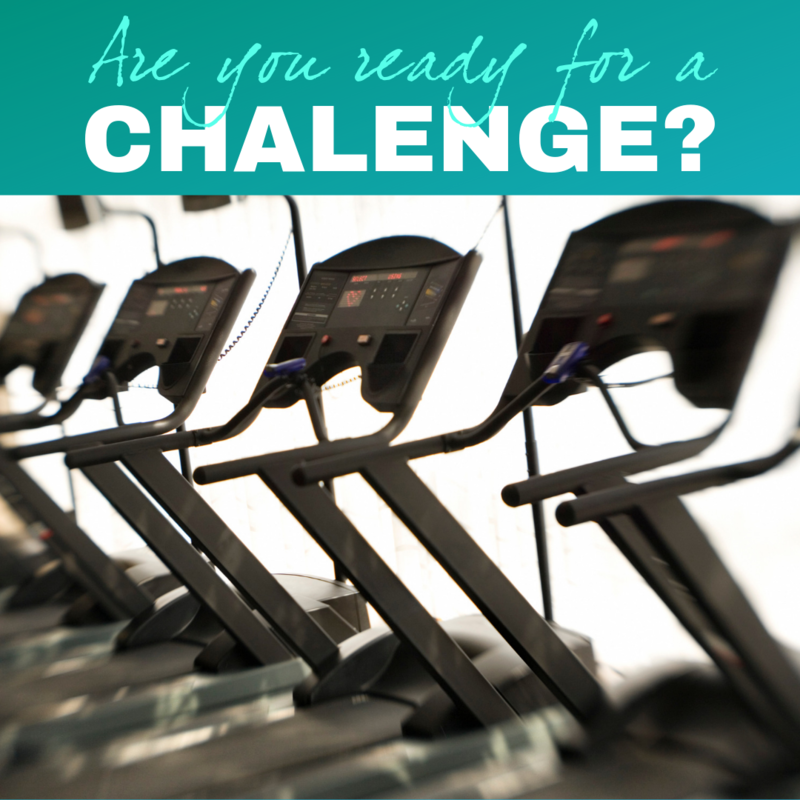 I’m all signed up for the January challenge and I’m ready to change more habits. What do you need in order to make the changes and growth you are pursuing this year? Go get what you need. PS: If you want to join the challenge, you can contact Coach Mari for a complimentary consult.